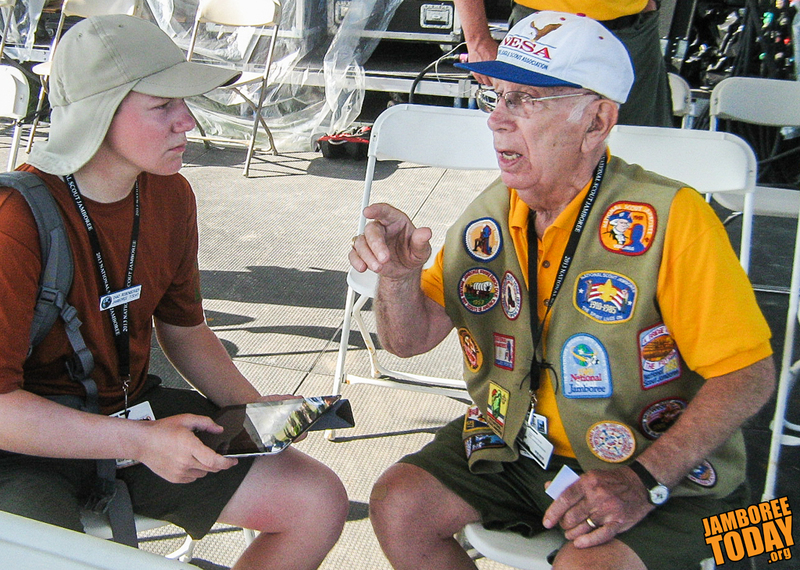 Anthony DiSalvo (r) recalls stories of the 17 National Scout Jamborees he has attended, including the very first in 1937 in Washington, D.C., to Jamboree Today's Chad Rodenberger. Photo by Rich Diesslin. The 2013 National Scout Jamboree had a lot of remarkable people in attendance. His Majesty Carl XVI Gustaf of Sweden, a life long Scout. TV host Mike Rowe, an Eagle Scout. There were corporate CEOs and philanthropists, teachers and scientists, artists and Olympians. All contributing to a great jamboree. But how many had been in attendance at the 1937 National Scout Jamboree, the very first gathering of Scouts from across America? Not only that, he has attended almost every national jamboree since 1937. DiSalvo, now member of the 2013 jamboree staff, was eight years old in 1937. He visited his uncle at the jamboree in Washington, D.C. There were 25,000 Scouts in attendance, most of whom arrived by train. President Franklin D. Roosevelt also turned up at that jamboree. Jamboree Today published its first issue there, while NBC and CBS radio broadcast live from the event. "All of the jamborees were magnificent," he says, and each jamboree got "better and better over the years." DiSalvo says his favorite jamboree is the 1960 National Scout Jamboree in Colorado Springs. Over 56,000 Scouts were there, celebrating the golden jubilee of the Boy Scouts of America as the organization turned 50. He is impressed very much by this year's jamboree as well. "The new stadium is magnificent and the place is amazing," DiSalvo says of the Summit Bechtel Reserve.